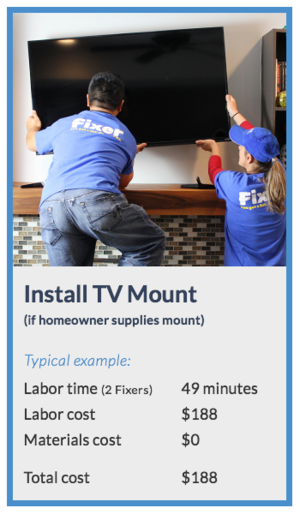 Your Fixer’s time is prorated to the minute after a one hour minimum. So, if your job takes 1 hour and 5 minutes to complete, you pay only for that time. Certain jobs require more than one Fixer, and if that is the case, the rate is $94/hour for each Fixer working quickly and safely to complete the job. Each Fixer arrives with the right tools and materials to complete most basic projects . We only charge for the materials we actually use on your project. If your project requires specific materials - backsplash tile, a particular color of stain or paint, or specific door or fixture - we are happy to help in the order and pick of those materials for a flat $50 shopping fee. No matter how many brick and mortar or online stores we need to coordinate or pick up from to get your project right, that fee stays the same. We never turn on the hourly clock for shopping - and you end up saving time and money letting our experts handle things. We are typically able to provide initial estimates for most common home repair jobs online. We love to see photos as well so we can get it right. Your Fixer will always confirm the estimate in-person when he/she arrives and get your permission to proceed before they start the work. The final cost is determined based on the actual time and materials used. If you prefer an on-site estimate in a separate visit. We charge $94 and will credit that towards your first hour of work when we return to do the job.